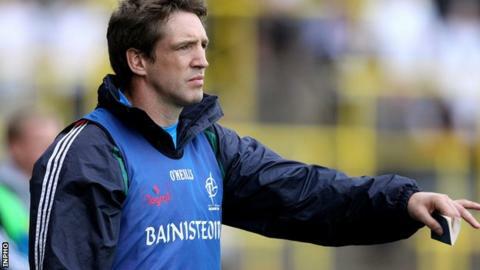 Armagh's former All-Ireland captain Kieran McGeeney is staying on as Kildare manager for one more season. The 2002 All-Ireland winner was believed to be contemplating stepping down in the wake of Kildare's big All-Ireland quarter-final defeat by Cork. However, Kildare released a statement on Wednesday evening confirming that the Mullaghbawn native will be staying on for a sixth year at the helm. McGeeney committed to another year after talks with chairman John McMahon. The Armagh legend had been linked with the vacancy in his native county after Paddy O'Rourke's resignation as manager in July. However the position was subsequently filled by Paul Grimley, who was his assistant in Kildare for a couple of seasons. Kildare's statement confirmed that 2013 "will be McGeeney's final year under the current agreement".